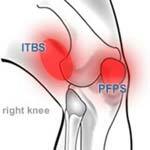 Knee pain is the main symptom of IT band syndrome. The pain feels the worst when your heel hits the ground when you are walking or running. The pain may start at the knee and radiate to the hip. Another symptom of this syndrome is pain when the knee is flexed, particularly when trying to go down or up steps. A doctor will look for certain tender points that are specific to IT band syndrome. Many people develop sore knees from running. Another common cause of knee pain is a meniscus tear, where the cartilage in the knee is actually torn. Treatment begins with icing the painful area, getting proper shoes for your sport, and a routine of iliotibial band syndrome stretches to bring relief and help prevent future problems. People with this syndrome should rest for a number of days before resuming training. If they must train, they should choose cross training activities that are low impact. Over the counter or prescription non-steroidal anti-inflammatory medications reduce pain and swelling. In treatments aren’t helping, a physical therapist should be consulted. If these treatments do now work, the doctor may administer a cortisone injection to reduce inflammation. In very rare cases, surgery is the final option.